Nausheena Hussain is another voice you’ll hear on Saturday, October 13. She will share her hope of using the power of storytelling to build equity among community. She has seen the influence a story has to transform an environment from fear of the unknown to genuine curiosity to learn about others’ differences. As the co-founder and executive director of Reviving the Islamic Sisterhood for Empowerment (the Sisterhood), she has witnessed the ability of a new narrative to help progress a community forward. Nausheena describes the regression she observed of Muslim women from participating in their community. She felt this changed much more evidently in the past two years as more hate crimes were being perpetrated against Muslim women. Because of the fear created of being a target, the response was to shutter themselves away. Nausheena determined that if change was to happen, people needed to step forward to help spark conversation, curiosity, and a community truly reflective of diversity. Nausheena draws inspiration from women in history who have led the way to break through the glass ceiling before the glass ceiling was a defined concept. She cites women as far back in history as Harriet Tubman and as recent as Tamika Mallory, Linda Sarsour, and Carmen Perez, who were key in organizing the Women’s March in 2017. Throughout her research, Nausheena has found many stories that have been left untold. Her interest is in questioning the gatekeepers of the stories as to why they haven’t been revealed. Learning the history inspires her to activate change now. Through the Sisterhood, she has been able to encourage, model, educate and inspire women to be active in their local political landscape. She believes people must start locally, being knowledgeable and conscious of the decisions being made that will affect them. Social media, and specifically Facebook Live has allowed Nausheena and others in the Sisterhood to share information so others can learn from the ground level of how to participate in a democracy, how to register to vote and even how to become a delegate. 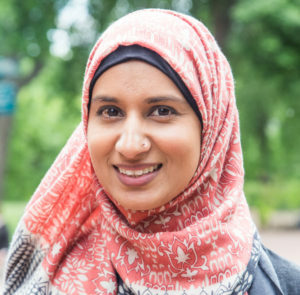 The increase in participation by Muslims and specifically, Muslim women continues to motivate Nausheena to keep working toward a diverse representation of everyone who resides in the community.